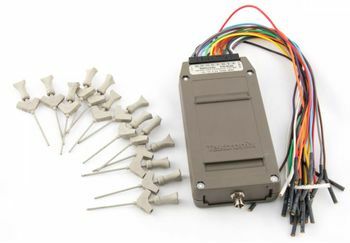 The Tektronix P6408 is a 16-channel word recognizer/trigger probe for use with digital or analog host instruments (such as oscilloscopes or logic analyzers). The P6408 allows triggering on logic states, with the trigger word manually programmed via 16 miniature DIP switches on the probe pod with HI, LO, and DON'T CARE recognition capabilities. The P6408 leads are connected to the DUT (Device Under Test) via a pair of 10-lead cable harnesses common to the P64xx probe series. The output is a socket for a P6109 ×10 passive probe that was included. The P6408 derives its operating power from the DUT, drawing a maximum of 100 mA at 5 V. An optional probe power cable allows the P6408 to be powered from a Tek scope with a probe power connector, an 1101A Probe Power Supply, or from a user-furnished +5 V supply. The P6408 uses the P64xx-family 10-wire input lead harnesses with 0.2" connectors. Is also possible to use standard jumper wires with pins, sockets or clips on the other end for connecting inputs.